Kurt Manwaring has published an interview with historian Ignacio Garcia over on his site, From the Desk. Garcia earned his Ph.D. in History from the University of Arizona and is Lemuel Hardison Redd, Jr. Professor of Western & Latino History at Brigham Young University and is President Elect of the Mormon History Association. An excerpt from Manwaring’s site is posted below; click over to From the Desk to read the rest! What are the most important changes MHA has made in the past decade and where do you hope to see the organization 10 years from now? What factors most influence the organization’s ability to realize the progress you envision? The Mormon History Association is conducting a search for editor of the Journal of Mormon History. The editor of the journal determines the content, solicits submissions, oversees peer review, works with submitting authors in performing substantive and stylistic content editing, and coordinates with a JMH production staff and the University of Illinois Press to ensure that issues of the journal are published according to deadline and within budget. The editor has full editorial control of the journal but reports to the MHA board of directors in maintaining a high-quality product that serves as the flagship publication for the organization. The Mormon History Association is particularly interested in candidates with an academic institutional affiliation but will consider submissions by all qualified applicants. The person chosen to be the editor will be appointed to a four-year term beginning in January 2020, renewable at the discretion of the MHA board of directors. On April 12th and 13th (this coming weekend!) there is a festschrift/retirement event in celebration of Laurel Thatcher Ulrich’s illustrious career as a Pulitzer and Bancroft Prize winning historian. She joined the history department faculty at Harvard in 1995 and did incredible work to transform the university and mentor students there. But, as many of us in the Mormon history world know, Laurel was not only prolific author and mentor in the Ivy League halls. She also helped to foster Mormon feminists and upcoming scholars in Mormon history. On April 13th, MHA’s executive director Barbara Jones Brown will be speaking about Laurel’s mentorship in the Mormon history community. She would love to have people send her their experiences with Laurel as a mentor in the Mormon history community. People can do so directly by emailing her (bjonesbrown [at} gmail [dot] com) or they can comment on this post with their experiences. I first met Laurel at MHA in 2013. I had bought her book Well Behaved Women Seldom Make History and I decided to muster up the courage to ask her to sign it. She agreed and opened the book only to find that it was an already signed copy. Oops. I asked her to sign it again because I am an awkward human being. In 2015, I moved to Boston and reintroduced myself (without mention of the first incident). I asked to audit her Harvard class on the family in American history and she graciously let me do so. This was the beginning of the mentorship relationship that I had with Laurel: she served as an anchor point for me in a vulnerable period for me as I was applying to PhD programs. I am certain that her letter of reference was one of the turning points that got me accepted into two history programs. Yes, Laurel is a well-decorated historian and Harvard professor. But to me she modelled something beyond just that. During the MHA conference in 2013, I remember watching as she challenged one presenter during the Q&A about the specifics of the Nauvoo Relief Society minutes. Laurel always seemed to me to model a quiet confidence in her ideas and research. She was not afraid to challenge assumptions or prod someone to better articulate their ideas. Laurel managed to strike a fine balance between critical and supportive that we so often long for in mentors. Please send your experiences to Barbara! On Thursday, June 6, 2019 the Fourth Annual Mormon Studies Publication Workshop will be held at the University of Utah. The workshop helped to create a sense of community among young scholars from a variety of places and disciplines while providing helpful feedback for developing projects. Over the past three years, we have received dozens of excellent submissions on race, gender, sexuality, and other historiographical fields. Last year, at Boise State University, we hosted scholars from across the United States California to Massachussetts. You can read more about the 2017 meeting at the John C. Danforth Center on Religion and Politics at Washington University in St. Louis here. Workshopped papers from the past three years have become parts of books published by (or under contract with) Oxford University Press, University of Nebraska Press, and Routledge University Press; the Journal of Religion, the Journal of Mormon History, Church History: Studies in Christianity and Culture, completed dissertations, and other distinguished venues. The workshop, “Writing: Strategies on How and When to Write,” will be held Thursday, June 6 from 10:00 AM AM-3:30 PM. There will be no cost for the workshop beyond punctual arrival and rigorous intellectual engagement. I’ve spent a bit of time in the last month thinking about titles. I’m considering my own potential book titles, but also the titles of two books that I’m currently reviewing. When I got a copy of The Expanded Canon: Perspectives on Mormonism and Sacred Texts edited by Blair G. Van Dyke, Brain D. Birch, and Boyd. J. Petersen (Salt Lake City: Greg Kofford Books, 2018) I assumed I knew what it was about. Joseph Smith’s expansion on the Christian canon has been a lightning rod for attention since before he organized any church. I expected a focused consideration of Latter-day Saint expansions to the Christian canon: The Book of Mormon, Doctrine and Covenants, and Pearl of Great Price. 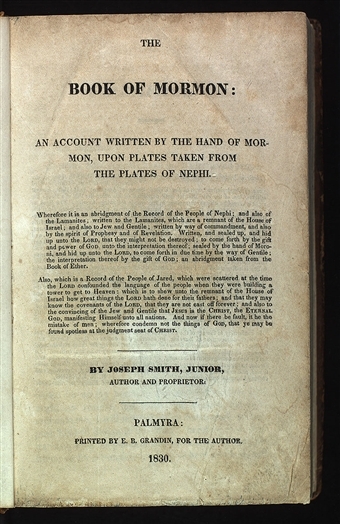 Likewise, when I first saw Larry Morris’ Documentary History of the Book of Mormon (Oxford and New York, Oxford University Press, 2019), I made assumptions. I initially panicked wondering if his work overlapped too much with my own current Book of Mormon reception book project and then hoped that he laid out the publication history through documents so I didn’t have to sort it all out myself. Several articles on Mormon history or Mormon Studies have been published in non-Mormon specific venues in the past few months. While the Journal of Mormon History, Dialogue: A Journal of Mormon Thought, Sunstone, and BYU Studies continue to be sources of groundbreaking and award-winning scholarship, they are not the only journals interested in the academic study of Mormonism. I’ve included the abstract and link to each article. Let me know if I missed any from the past few months in the comments! We are beyond thrilled to be able to offer two research grants to support work in Mormon women’s history–one student award and one independent scholar award. Deadline to apply is April 1, so don’t delay. Click here for details on the Student Grant and here for details on the Independent Scholar grant.